A court has thrown out a lawsuit brought against American Airlines by a woman who was stranded for 9-1/2 hours on the tarmac in Austin, Texas, in 2006. In dismissing the case, US District Judge Robert Dawson, who apparently has never been on a plane in his life, said airlines are not legally bound to provide a "stress-free environment" when such a delay occurs. But Catherine Ray, who brought the lawsuit that charged false imprisonment, isn't giving up the fight. She's filing a motion for the judge to reconsider the case, and if that fails, she plans to appeal. In part because of the 2006 strandings, consumer groups have been pushing for federal legislation that outlines passengers' rights during lengthy tarmac delays. The dismissal of Ms. Ray's lawsuit makes it even more important for Congress to act, the consumer groups say. "The bottom line is that if passengers can't get relief from the courts, we have to have Congress step in," says Kate Hanni, founder of FlyersRights.org. She brought the lawsuit that is pending in California. One of the bills pending in Congress would require airlines to let passengers off the plane after a three-hour tarmac delay. But the airlines and some airline analysts say such a requirement could cause even more passenger inconvenience by increasing the number of cancellations and creating even longer delays. That's because once a plane goes back to the gate, it loses its place in the line for takeoffs. In dismissing Ray's case last week, Judge Dawson wrote, "the court is sympathetic to plaintiff ... and believes that defendant could and should have handled this situation differently." But, he concluded, "the facts do not support a claim of false imprisonment." The judge noted that Ray and the other passengers were given the opportunity to get off the plane. But that happened only within the first two hours of the delay, Ray counters. The last seven hours, she says, passengers had no option to leave despite overflowing toilets and insufficient water and food. But there's conflicting testimony about that. In a deposition, the pilot of the flight said buses came every two hours to offer passengers the opportunity to deplane. Ray disputes this. She also contends that the judge dismissed the case while her attorney was still deposing other American Airlines employees. "A lot of the evidence that proves our point was not considered in his decision," she says. "I'm very disappointed." American Airlines is pleased by the decision, says a spokesman. "Essentially, the judge found that this was a customer-service issue and not something that should be litigated," says Tim Wagner. 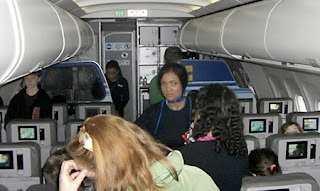 After the 2006 incident, American Airlines instituted a new policy: After a plane has been on the tarmac for four hours with the door closed, passengers should be given the option of deplaning. "It was one of those incidents that we learned from, and it was a very rare thing," says Mr. Wagner.